LS travel retail North America is pleased to announce the opening of five new locations in Montréal-Trudeau International Airport (YUL). In conjunction with the Airport’s redevelopment plan, the openings include Découvrir Montréal, Cirque du Soleil, Lolë and two RELAY stores. Découvrir Montréal is a tailored version of LS’ proprietary concept, Discover. The only international airport-exclusive souvenir brand with locations across four continents, Discover offers a wide range of gifts that embody the characteristics of their location, in a design that reflects its unique vibe. The YUL store extends customers’ “Montréal experience” with an elevated gift and souvenir offering that features local products, including from the renowned Hudson’s Bay Company, in a branded shop-in-shop. 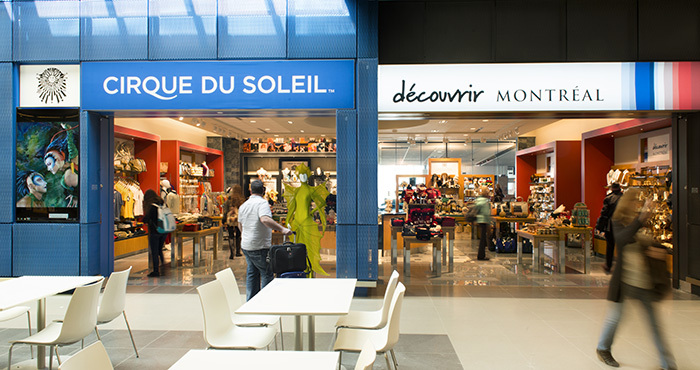 The unique flavor of Montréal is further conveyed with the addition of a Cirque du Soleil store. Founded in Montréal in 1984, Cirque du Soleil has evolved from a small group of innovative street performers to an international brand. Featured in six continents, 300+ cities and enjoyed by more than 100 million spectators, Cirque invokes the imagination, provokes the senses and evokes the emotions around the world. Now, that same wonder can be found in the Cirque du Soleil gift shop in YUL. The first ever Lolë airport store just opened in YUL’s International jetty. Born in Montréal in 2002, the very fast-growing Lolë, which stands for “Live Out Loud Everyday”, is a women’s lifestyle/active wear concept providing active, urban women with modern and versatile clothes and accessories for sports, travel, outerwear and every day wear. With well-being at the core of the brand, Lolë is renowned for its various outdoor yoga meet-ups, workshops and events. With 1,300 stores in 23 countries, RELAY is the only international Travel Essentials brand providing travelers with “one-stop-shop” convenience. Our two new pre- and post-security RELAY locations respond to the specific needs of YUL’s customers with a wide array of products including electronics, fresh grab ‘n’ go food, local souvenirs, quality travel essentials and a selection of reading materials, available in both French and English. With over 14 million passengers traveling through it each year, Montréal-Trudeau International Airport is the fourth busiest airport in Canada and serves as a major North American global Gateway.